Villa Bahagia is a luxury North Bali holiday Villa, located in Dencarick between Lovina and Seririt and is truly one of the most beautiful locations in the whole of Bali. Unlike the congestion of Kuta and Nusa Dua the north remains relatively unspoiled by high density living and traffic. VILLA BAHAGIA is spacious and has five bedrooms. This exclusive north Bali holiday villa is located at the beach. 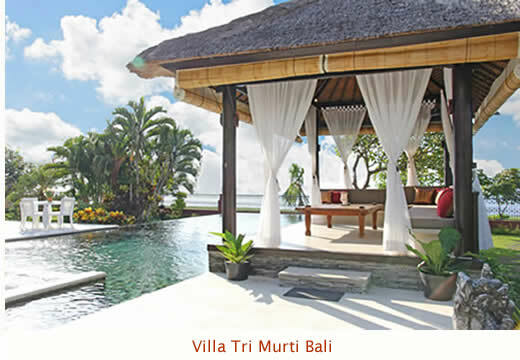 It is set around 1800 square meters of manicured, private gardens overlooking the beach and the north Bali sea. The main villa consists of three beautifully appointed bedrooms with double en suite, separate powder room and main bathroom. Dine inside or out via full width glass sliding doors that allow the breeze to flow through to the large entry foyer and covered balconies you will enter to find a breathtaking view of the Bali sea and a magnificent view over the north aspect gardens, pool and beachfront. Fully air conditioned and very well appointed you will love the private and large swimming pool and jacuzzi set amongst the coconut palms, pool deck and gardens having been established in 2006 the villa is spotlessly maintained and furnished to an extremely high standard. We welcome you to VILLA BAHAGIA, knowing it will be a holiday to remember in a location which is unique. Wonderful and incredible 7 days in Bahagia, what a villa! But the staff made it complete. Iluh, Komang, Ketut, Gede. What a team. Not only housekeeping. Iluh, Komang, we didn’t eat in restaurants, we didn’t want it. They cooked 5 star food. Even my youngest grandchildren like that. Thanks, and see you again. We love it here! We didn’t want to leave. Only 1 day we went on a day trip and we already miss you! Hopefully we can come back for another relaxing, lovely vacation. You’re the best, all of you!! Thank you so much for the amazing, relaxing and wonderful days we had in Villa Bahagia. We had the pleasure to stay 6 nights. We enjoyed the beautiful garden with so many flower, sea view and fantastic pool. The staff was so kind to us. Luh and Komang thank you for the fantastic and delicious cooking and taking care of our 2 boys. Alexander and Maurits love you! We felt completely safe by the presence of Ketut during every nightThe staff made our stay in Villa Bahagia complete. Putu, thank you so much for bringing us everywhere!We will definitely come back and we will tell everyone about this lovely Villa! Thank you and we will miss you.